Like millions of American children during the Cold War, 10-year-old Samantha Smith of Manchester, Maine, was terrified of getting nuked by the Russians. News reports and TV specials about nuclear bombs, missile defense systems, and “mutually assured destruction” were commonplace, and Smith got more and more frightened about the possibility of war. 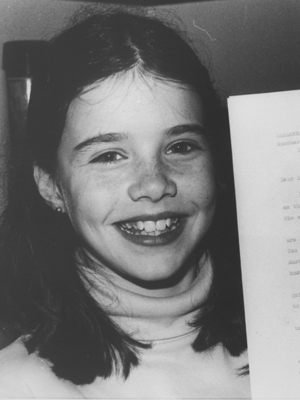 The Samantha Smith Project honors the young American girl who asked a simple question about war and changed the attitudes of two great nations. Busts of Samantha and her book Journey to the Soviet Union (a gift from Dot Walsh) are available for placement at children’s libraries and peace centers by contacting administration@peaceabbey.org. He did not answer right away, but a few months later there was a phone call waiting for her at the principal’s office at her school in Manchester, Maine. and so began her amazing journey. Samantha’s journey to the Soviet Union came to symbolize peace between the two nations. She proved that one person can make a real difference. Her courage, faith, and determination to make a positive change in the world make her a hero for all ages. Sadly, on August 25, 1985, Samantha and her father were killed in a plane crash. They were on their way home from London where she had finished filming a segment for the TV series. She was then 13 years old. Around the world, people remembered the inspiring girl and her famous trip. 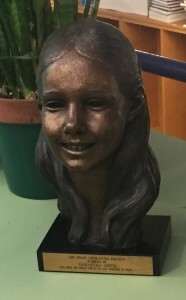 A school in Sammamish, Washington, was named for Samantha, and in Russia there were many memorials including a postage stamp in honor of their young American friend. Unfortunately, while Samantha effectively illustrated the power each of us has to make a difference in our world, many people today are not familiar with her story. 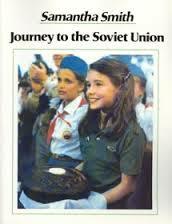 “Journey to the Soviet Union” now out of print is a powerful record of her accomplishment. We believe that Samantha’s message and the courage with which she delivered it can continue to inspire and empower people of all ages. 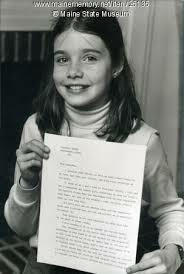 ABC Evening News on Samantha Smith.